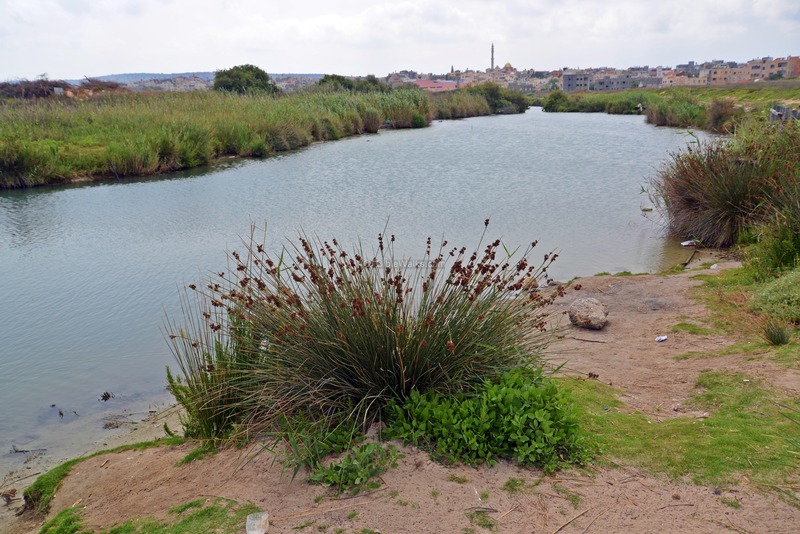 Jisr e-Zarka is an Israeli Arab town located north of Caesarea. Jisr e-Zarka ( "Bridge of the blue stream") is an Israeli Arab town located north of Caesarea, and built on a sandstone ridge along the coastal highway. 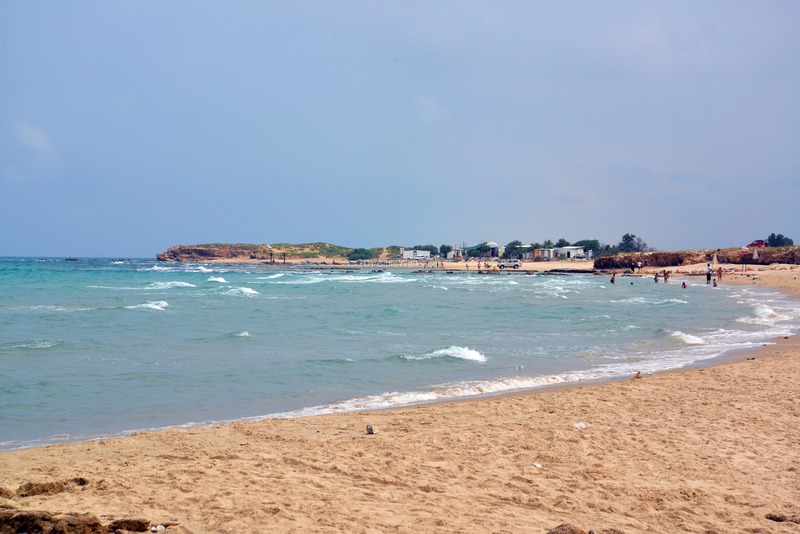 A number of nature and historic sites are located in the vicinity of the town, including: ancient aqueducts, ruins of the ancient city of Crocodilopolis, a stream, fishermen's village and pier and a beautiful beach. Note that Tel Tanninim, and the sites around it, were moved to another page. Jiser e-Zarka is located on the west side of the coastal highway, north of Caesarea. Access to the town is through an entrance road, which starts at the Beit Hannania junction on the parallel highway #4. 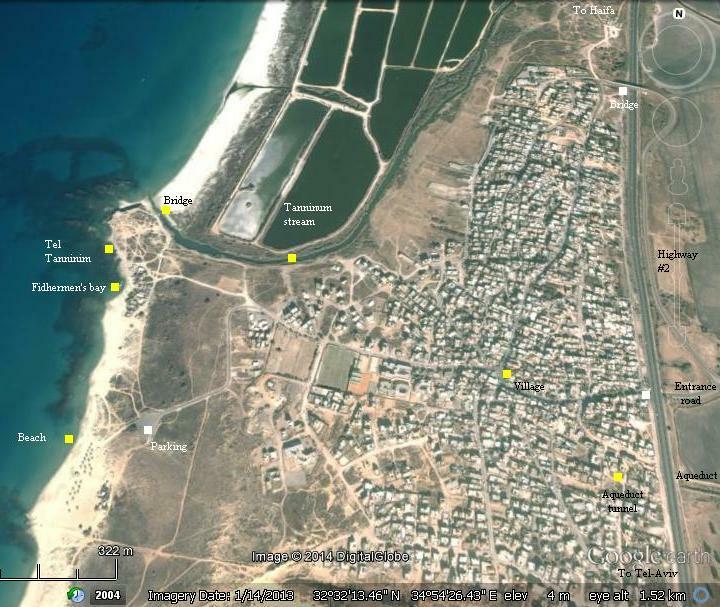 An aerial view of the area around Jiser e-Zarka site is seen here, with an indication of the major points of interest. You can click on a yellow square to navigate to the selected point in this or other web page. The town of Jisr e-Zarka has 14,000 Muslim residents (in 2014), which live in densely built houses. A minority of 700 residents came from Egypt with the armies of Muhammad Ali, who overran the country in 1834 following the peasants revolt against the Egyptian rulers. The majority of the residents originated from the Bedouin tribe of Ghawarina, who came at the end of the 19th Century from the area of the Jordan Valley to the nearby Kabarah/Zarka marshlands, east and north of the village. As they were used to live in marshlands and immune to the deadly mosquitoes, the Bedouins were hired to dry out the marshes. After the completion of the project in 1924, they were offered land on the ridge above the marshlands, in the present location of the town. Since the residents of the town were regarded outsiders by the Arab population in Israel, first-cousin marriages were the only demographic solution in the town, resulting in an increased risk of genetic disorders. 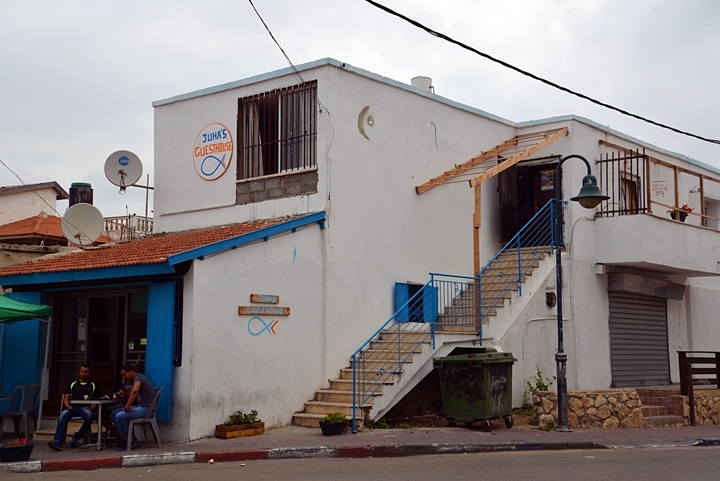 The village is built on a ridge of Kurkar (calcareous sandstone), which stretches along the coastline of Israel. This type of hard sandstone is actually a fossilized sea sand dune, and is unique in the World. Along the eastern side of the town are visible remains of a large quarry that stretched along the ridge. During the Hellenistic, Roman and Byzantine periods, the stone cutting industry flourished in a growing demand for quality building blocks. 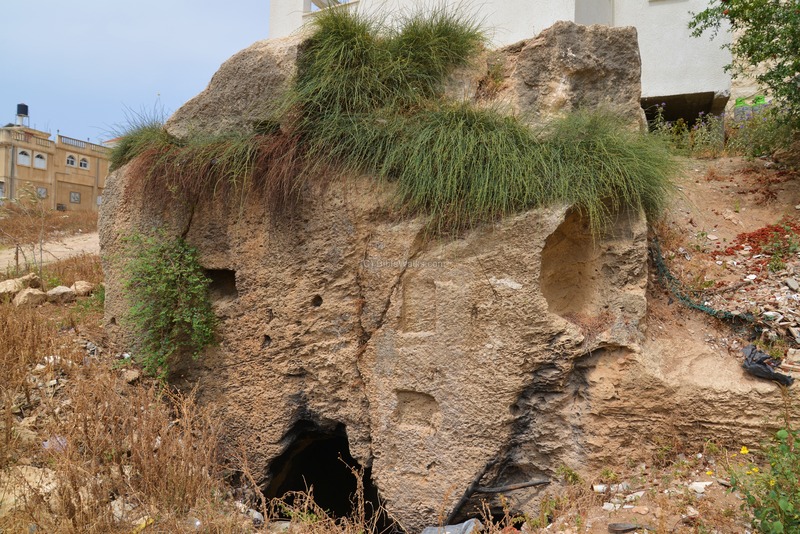 The sandstone ridges along the coast of the Carmel became one of the major stone cutting centers, supplying stones for the newly established Herodian Caesarea and other cities. Villages of stone cutters were established on the dozens of sandstone (Kurkar) hills along the coast of the Carmel. In addition to stone cutting, they were also fishermen and supplied services to the trade route that passed on the side along the ridge. 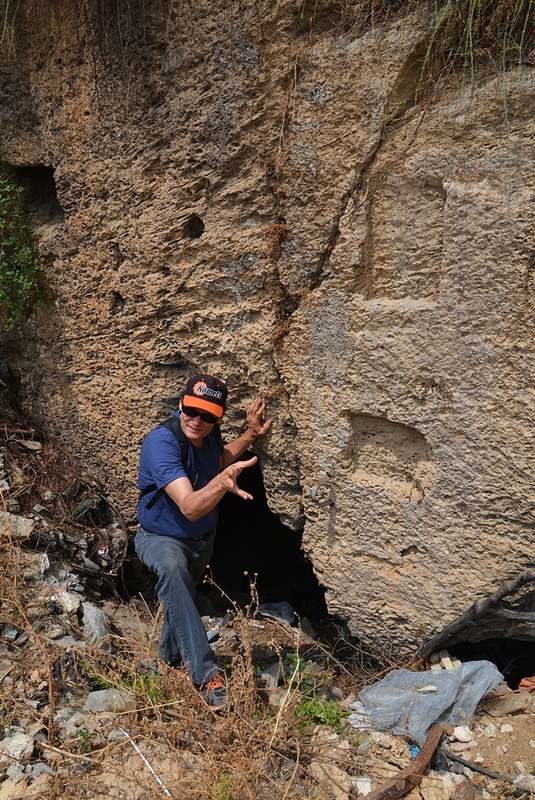 After the stones were cut away, the remaining parts of the hills were reused for digging grand burial caves, and building agriculture installations such as wine presses, cisterns and wells. 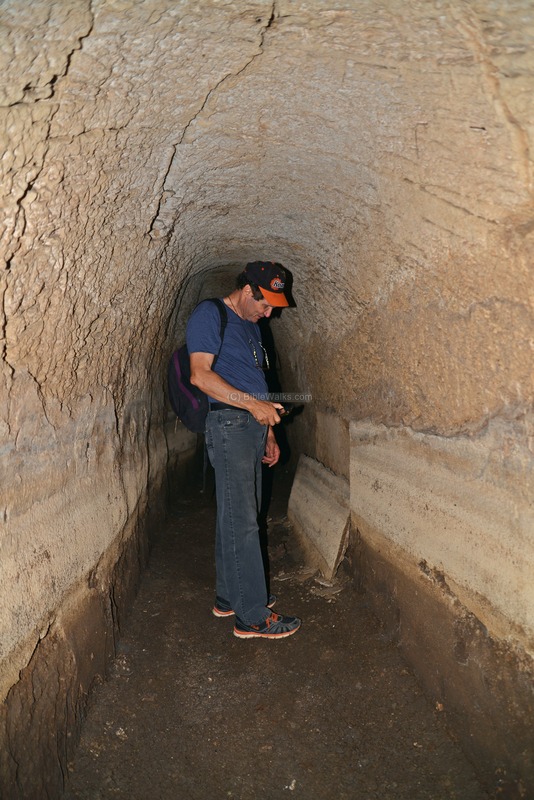 The Roman high-level aqueduct had to pass the hill in order to arrive the great city of Caesarea, and the builders of the aqueduct drilled a tunnel through the hill. This point, west of the point the aqueduct crosses the highway, is where the tunnel started. In the photo, Shei'ke stands near the eastern entrance to the tunnel. 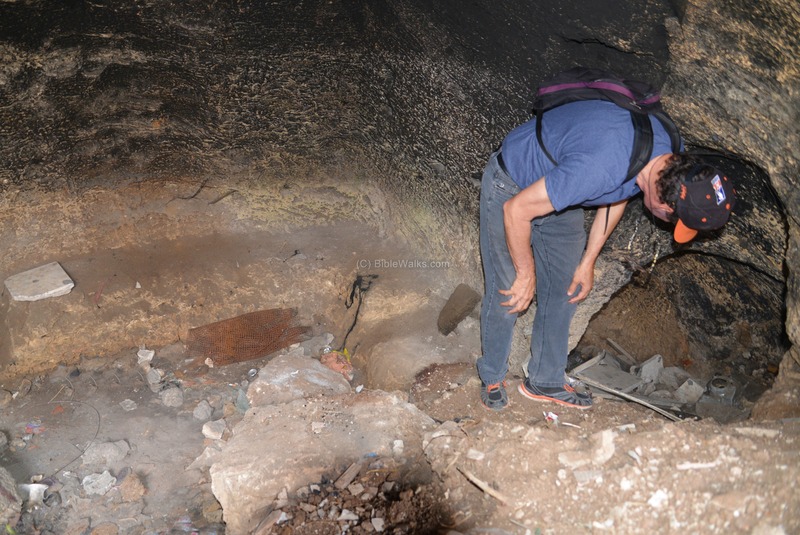 When we captured these photos (2014) the entrance to the tunnel was partially blocked by garbage, and in 2016 our reader M. Hartmann reported it was blocked by a fence. It is unfortunate that this tourism pearl is neglected, and we hope the local municipality will clean the entrance and make it available for visits. 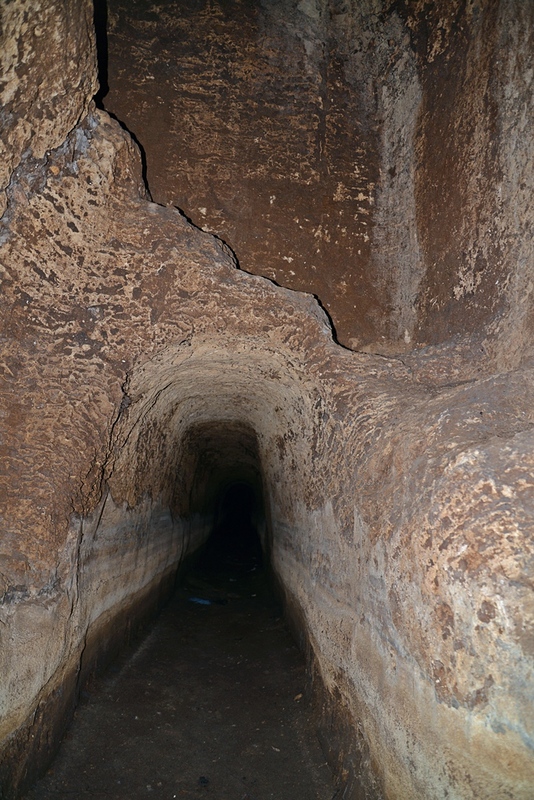 Beyond the entrance is a chamber, with an opening to the tunnel on the right. Walking along the tunnel, for about 100m, is easy. In some of its parts you can walk up straight. 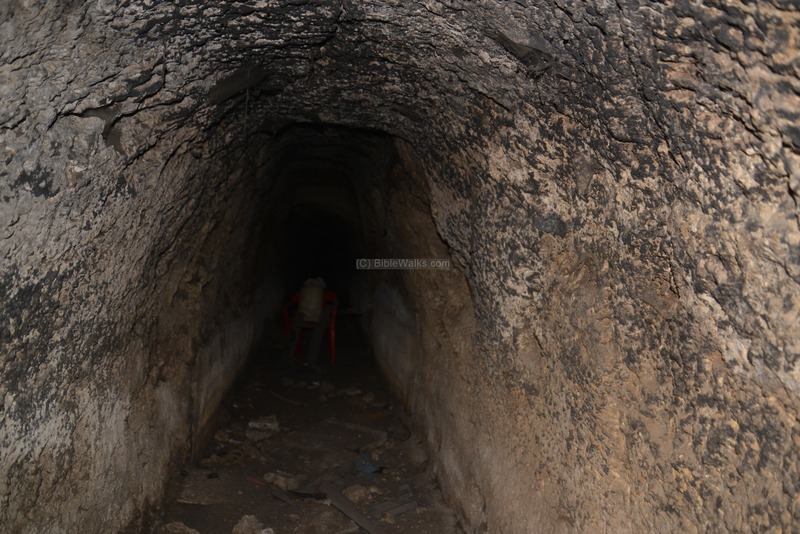 "The aqueduct, which from the point of crossing the Zerka [BW: west of the town] has run due west, now reaches the low limestone ridge separating the plain from the shore, and passes through it in a tunnel now much choked up. Near this point are extensive quarries, whence the stone for the aqueduct was probably obtained. The length of this tunnel is about a quarter of a mile, and the channel is at its deepest 30 feet or more beneath the surface... 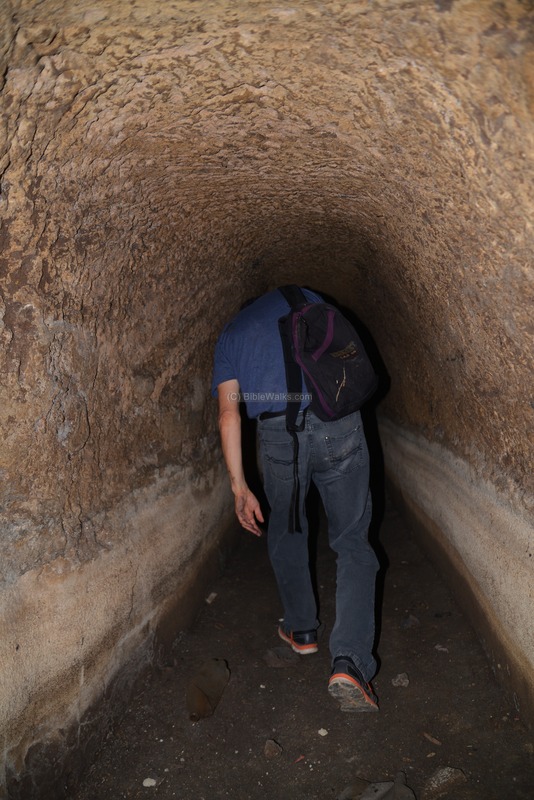 The tunnel below is too much choked to allow of accurate measurement, but must have been at least 3 feet high and 2 feet 6 inches broad. After passing through this ridge, which is of soft stone easily tunneled, the aqueduct turns due south, and runs along the shore for rather more than a mile, its course being marked by a ridge of loose sand blown over it and entirely hiding it". Along the lower sides of some of the tunnel walls are remains of a plaster. 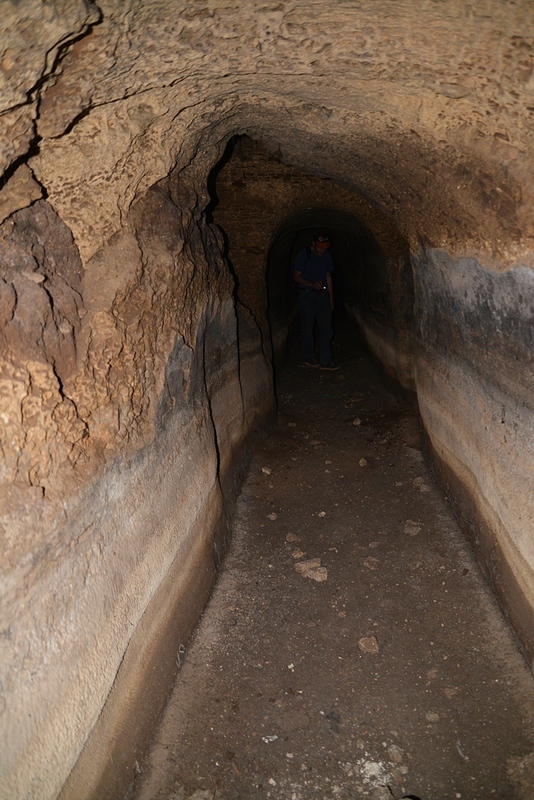 Along the tunnel are vertical shafts, which were used during its construction for the workforce, and later during the operation of the aqueduct in order to clean up the tunnel and draw water. 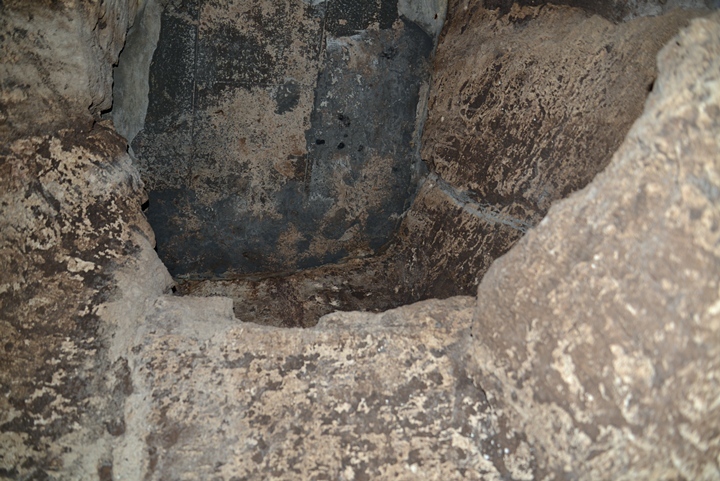 A spiral staircase, which is seen along the walls of the shaft, leads up and down. "It is reached at intervals by well-staircases cut in the rock probably first made to facilitate the cutting of the tunnel, and afterwards useful for drawing water. 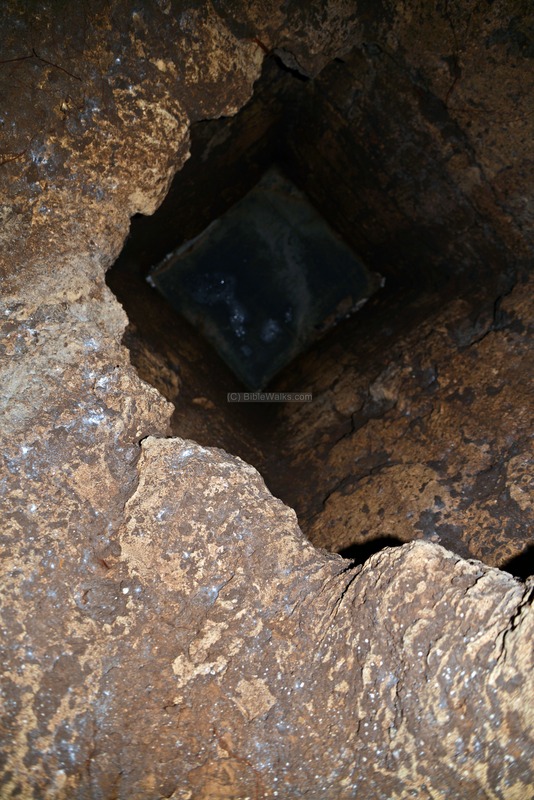 One of these was a rectangular shaft, 26 feet 8 inches deep, and 10 feet 8 inches by 1 1 feet 3 inches across at the top. A flight of stairs descends along the sides, and passes round twice, reducing the breadth of the shaft at the bottom to 2 feet 8 inches by 3 feet 8 inches. The flights are 2 feet broad, and the steps about 6 inches rise". The shafts are closed today, as modern buildings of the town are built over the tunnel. The town of Jisr e-Zarka has 14,000 residents (in 2014), which live in densely built houses. The road to the beach crosses the town through narrow streets. A guest house was recently founded in the village. 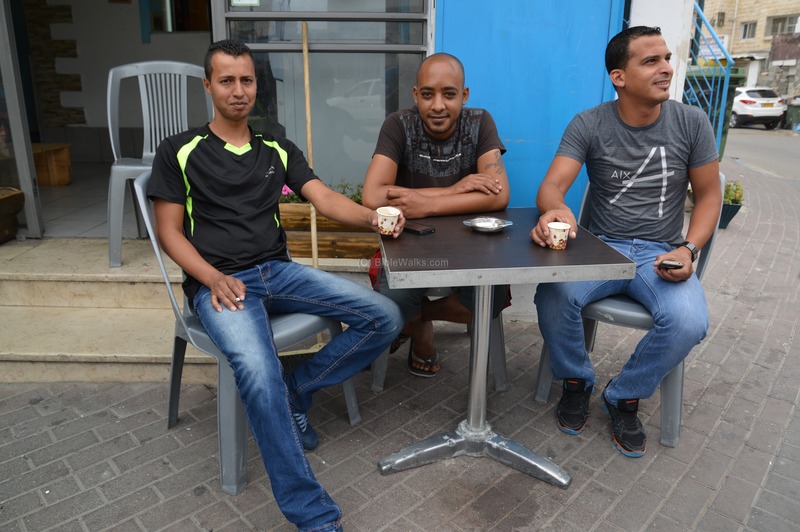 This entrepreneurship is one of a kind in Arab villages, opening the barriers which currently separate the Jewish and Arab populations. 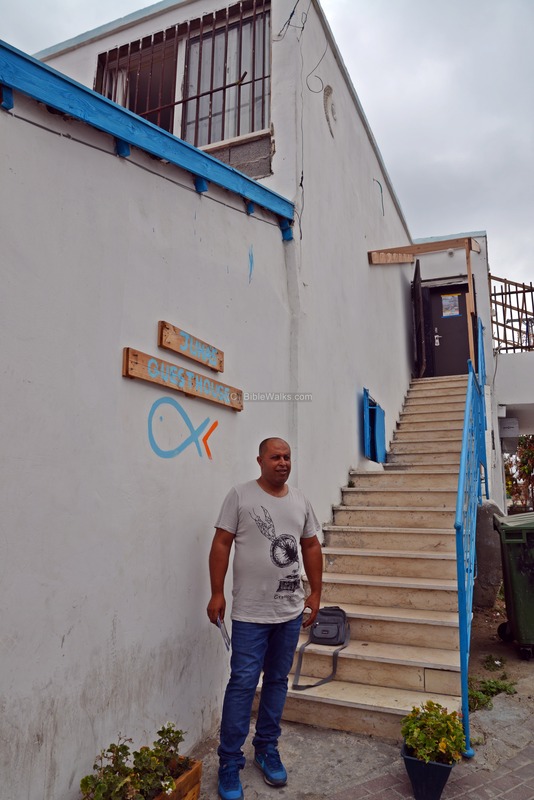 The guest house was founded by Neta Hanien - an Israeli Jew - and Ahmad Juha - a local Muslim resident, who is seen here standing on the staircase. In front of the cafe, below the guest house, the local residents meet. 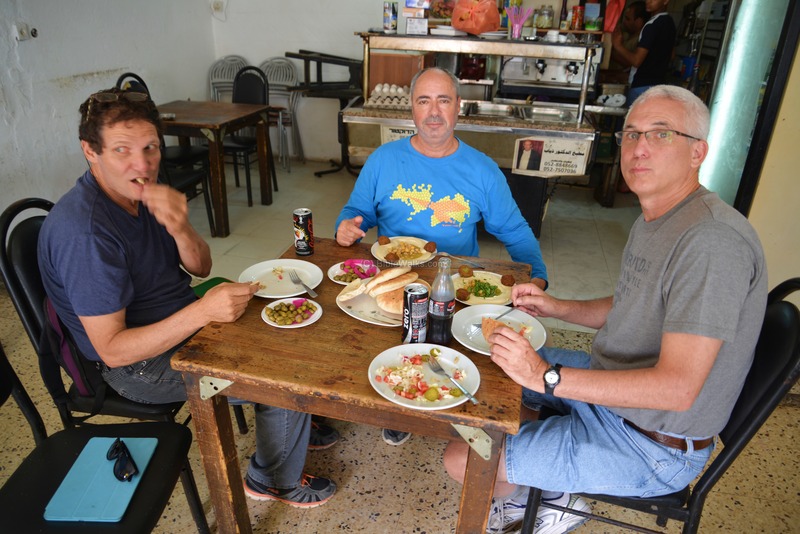 Across the street is a Hummus eatery, where we enjoyed a good meal at a fair price. A typical meal looks like the following serving in the photo below. 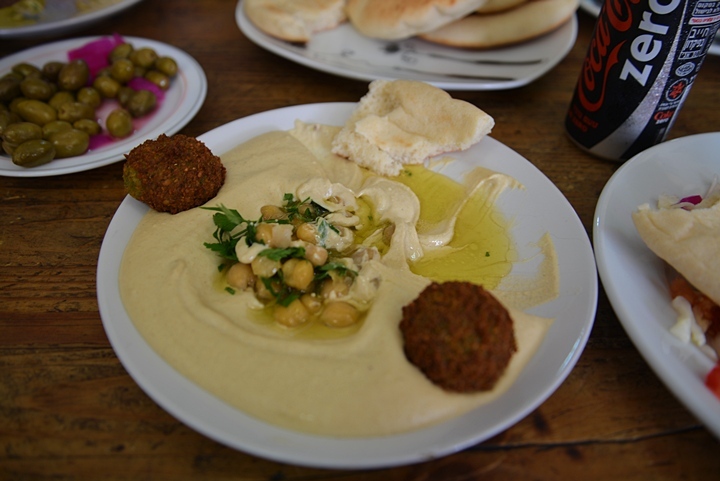 The hummus paste in the plate includes a dozen heated chickpeas, a pair of falafel balls, a sprinkle of parsley, and olive oil. Pita bread, dipped into the paste, is used to pick up the paste. Green olives, a drink and salad complete the tasty meal. Tel Tanninim ("Crocodiles mound"), the site of the ruined city of Crocodilopolis, is located to the west of the village. South of it is a fishermen's village and pier, and a public beach. These are reviewed in another page. e-Zarka, in Arabic: "the blue"
Jerusalem Talmud (Hebrew; Demai Chapter 2, 1 page 8)- reference to "Migdal Milcha" at the edge of Caesarea.